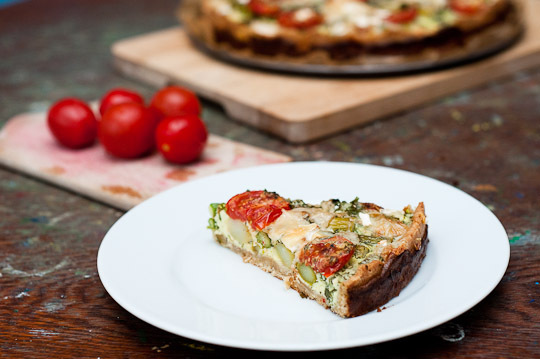 i made this tart in a hurry, and while doing so i found out that a few minutes in the freezer are for the pastry as good as an hour in the fridge. anyway the pastry was very nice – i tried a mixture of white flour and dark flour (whole grain). next i may try it with spelt, as suggested in various other recipes. mix flour and salt, using a pastry cutter cut the butter into the dough. add egg and knead quickly. put for 10 minutes in the freezer. transfer the dough in a 26 cm baking pan (unfortunately i do not have a proper tart pan – yet), spread and pat it into the pan. press it up the sides about 3 cm high. put the pan into the freezer for another ten minutes. bake in the preheated oven at 200°C for 10 minutes, afterwards let it cool a bit. wash and prepare the asparagus, remove and/or peel the end parts as needed. cut in pieces of 10cm. 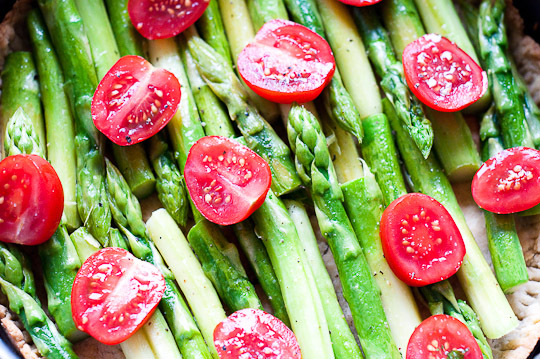 in a large pan, melt butter and cook asparagus for five minutes. season with lemon juice, salt and pepper. mix crème fraîche with chopped parsley, then add eggs. stir well. season with salt and pepper. 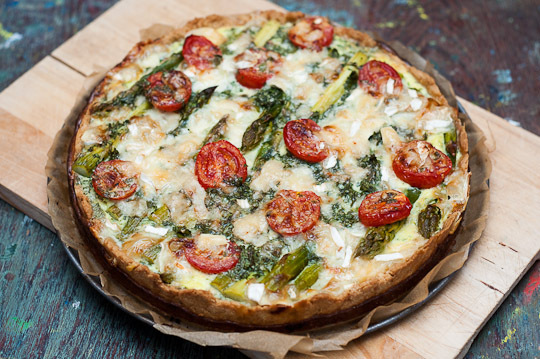 arrange the asparagus on the tarte shell, cut tomatoes in three slices each and put on the asparagus. pour the egg mixture over it and bake at 175°C for 15 minutes. remove from the oven and sprinkle with grated cheese. i used a mixture of parmesan and camembert. put the tart back in the oven and bake for another 10-15 minutes. my plan was to have it for dinner with the family yesterday, and eat leftovers for lunch today. and yes, there were still leftovers. but a quick check around midnight confirmed my creeping suspicion that they might not see the daylight again. omg this looks divine! just one question, what does 405 & 1050 mean for the flour? Is there any way to get this recipe other than in grams? It looks great, but I was home sick the day they taught grams. Don’t you know there’s nothing you can’t find on the Internet? Great photos and recipe. I’ve used that freezer trick too. 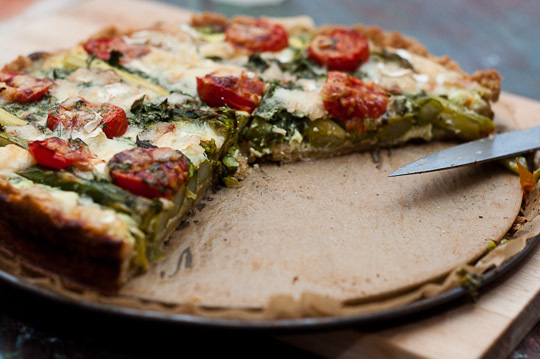 I just found your beautiful green asparagus tart on Pioneer Woman Cooks blog. I will definitely be trying out you recipe! Thanks. I use a scale with both metric and imperial for a lot if stuff – very helpful tool in the kitchen!!!! This looks delicious! Will try soon – thanks! ps. do you have a printer friendly option for your website? ?